After years of media amnesia, the bloody events of March 2004 abruptly reminded the "international community" that violence never ceased to gangrene Kosovo. Indeed, since 1999, under UN administration and occupying NATO troops, minority populations continue to be systematically discriminated and forced to flee from their traditional homes: and Kosovo is slowly but surely becoming "ethnically pure". 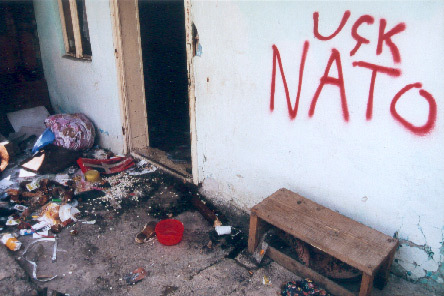 In spite of promises by western leaders to guarantee the future of Kosovo as a model of multiethnic tolerance, democracy and respect for human rights - reasons given to justify their 78 days and nights of blanket bombing of Serbia and Montenegro, as well as being enshrined in a UN resolution authorizing its ad hoc administration and occupation by NATO troops -, today Kosovo is far from being the "promised land". To the contrary, after five years under UN/NATO authority, unemployment has skyrocketed to 70%, crime is flourishing (arms, heroin, people trafficking.) and the Serbian province, whose "final status" could be examined next year by the big powers, is being "cleansed" of its many ethnic minorities: two thirds of them (Serbs, Roma, Muslim Slavs, Croats, Turks.) have been forced to flee and thousands have been assassinated or have gone missing at the hands of extremist elements of the Albanian community. About 150 Orthodox churches and monasteries - of which some date back several centuries - have been destroyed. Those tens of thousands of non-Albanians who have remained in Kosovo have been forced to withdraw to NATO "protected" enclaves where their freedom of movement is severely limited. In order to fully understand and report back on the plight of these forgotten populations and as an expression of our solidarity, the Brussels based Comité de surveillance OTAN (CSO, NATO Monitoring Committee), with the support of concerned organizations from various countries *, is presently setting up a Citizens' Fact Finding Mission to Kosovo scheduled for August 2004. We plan to visit several enclaves and to meet with local representatives and international officials. A visit is also planned to a refugee centre, probably in Serbia. The Mission will travel around the 15 th of August and will last about 8-10 days. Where possible, we shall rely on local accommodation and travel with our own cars. If necessary, we shall hire local means of transportation. As participants will be coming from different countries, we shall be meeting for a pre-trip briefing in a city in the region, probably Belgrade, the day before setting off together for Kosovo.